The first weekend I had Rachel, the new pup, we would walk and walk and walk and still, she wouldn’t be tired. On that Sunday, it wasn’t until the fourth mile that she looked even slightly worn out. I don’t know about her, but I certainly burned some calories. And that meant I was starving all weekend. After that long walk, my friend came over for a piece of cake. Later that evening, I went to my boyfriend’s family’s home, taking along my cake. They had a delicious carrot and pineapple upside down cake too, so we all had a piece of each. 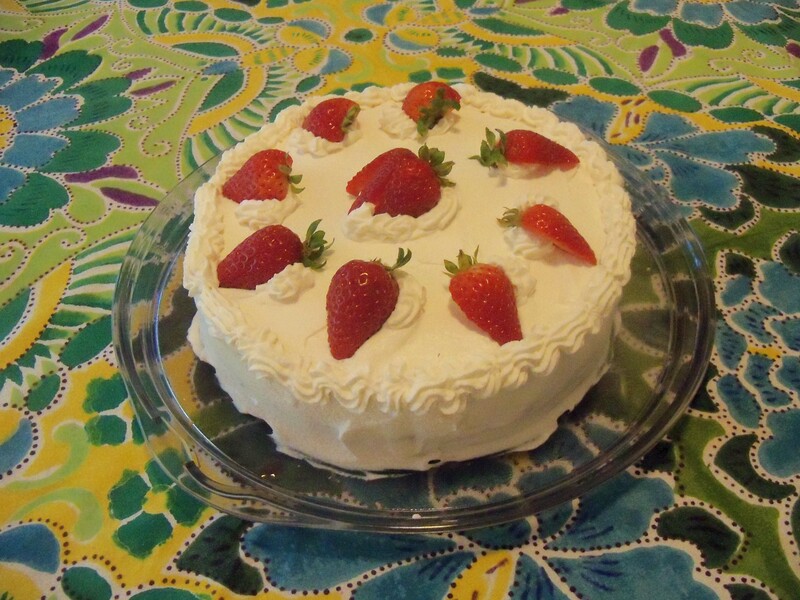 This French Strawberry Cake was from “Baking with Julia,” for Tuesdays with Dorie. My mom and agreed: It was awesome. The classic but dry genoise cake soaked up the sweet berry juice while the whipped cream frosting offered a creamy finish. It also wasn’t too difficult to make, and I would love to make it again for friends, with all sorts of different fruits. My mom’s gorgeous finished cake. Here’s how we made our cakes. First, we whipped up whole eggs, with sugar. You had to beat them for quite awhile to get the right, light consistency. Then, the recipe calls to add the flour, sifted. 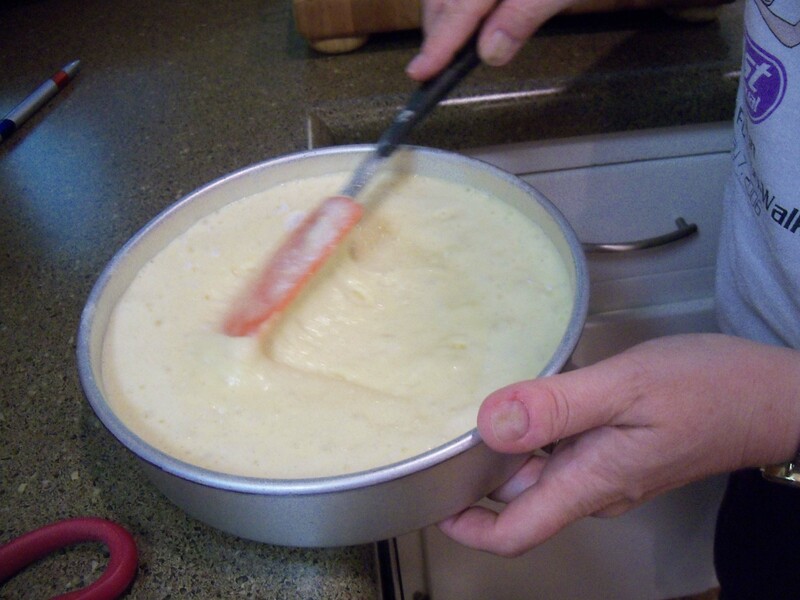 Since my mom’s cake ended up kind of doughy (little lumps of flour won’t bake out, she discovered), I sifted the flour directly on top of the batter and made sure to fold it together several times. 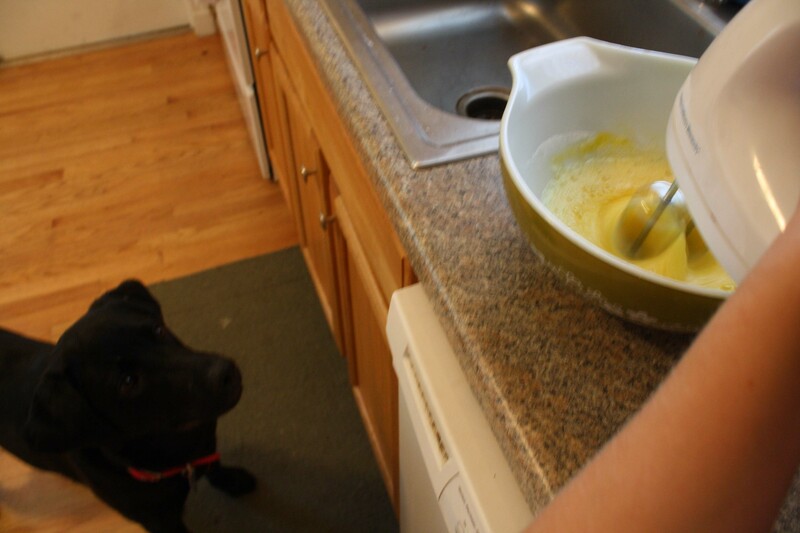 I also had a helper in the kitchen. She didn’t know what to think of the mixer at first! 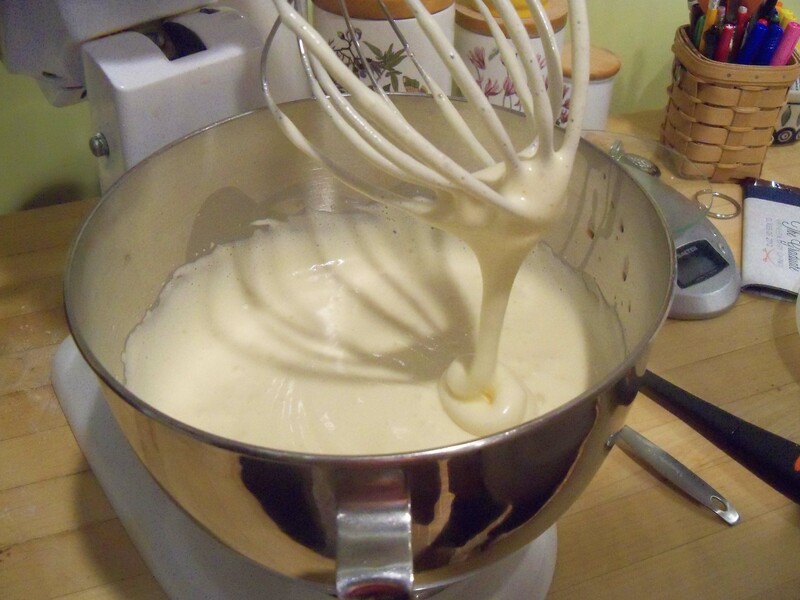 Once in the pan, the batter was very airy, with little bubbles at the top. 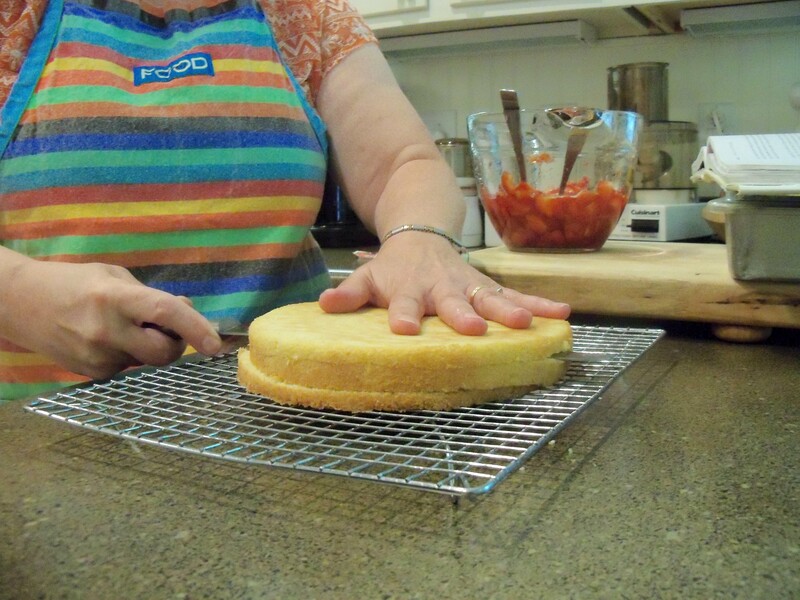 My mom used an 8″ pan, and was able to cut the cake into three layers. I made do with two layers, since I used a 9″ pan. 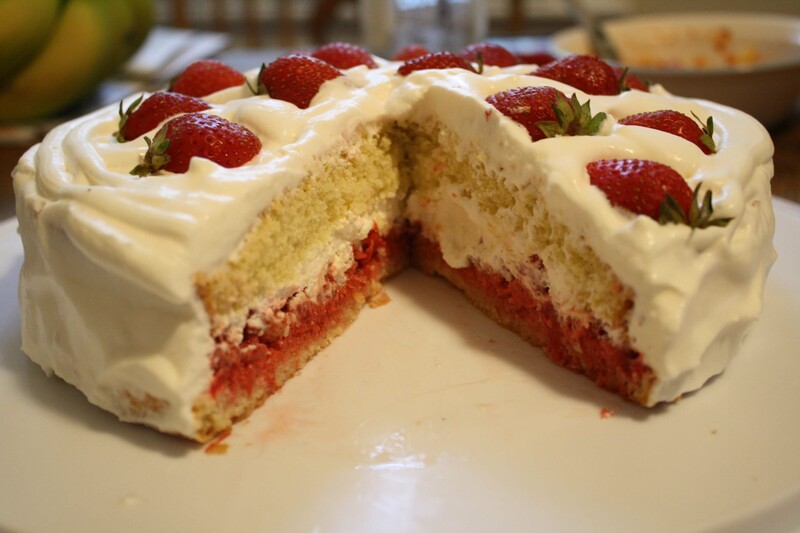 Each layer was topped with a sugar-soaked crushed strawberry mixture. I kept the extra juice, and let it soak into the cake. 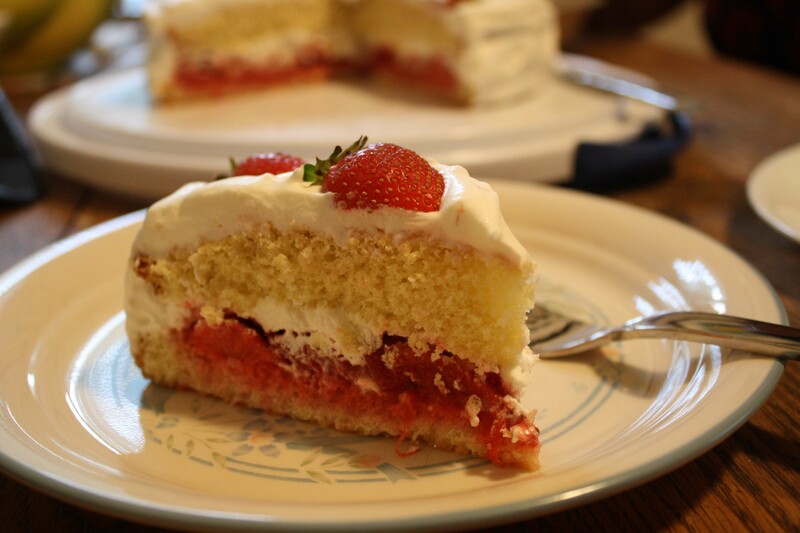 Then, the layers come together with a whipped cream topping, stabilized with a bit of sour cream. I didn’t beat mine quite long enough for it to stand up when piped, but my mom’s looked like it turned out well. 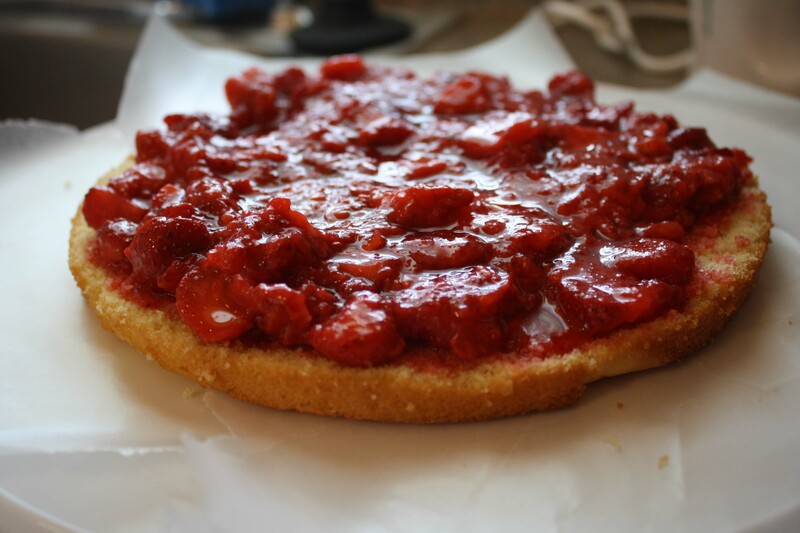 To see the recipe, check out Sophia’s Sweets and Sleep Love Think Dine. 2) How in the world do you stay so petite? I know, I know. You walk/run with your dog. Life is so unfair. Love your blog! Beautiful job Kate! When can we make this again? It looks fantastic! 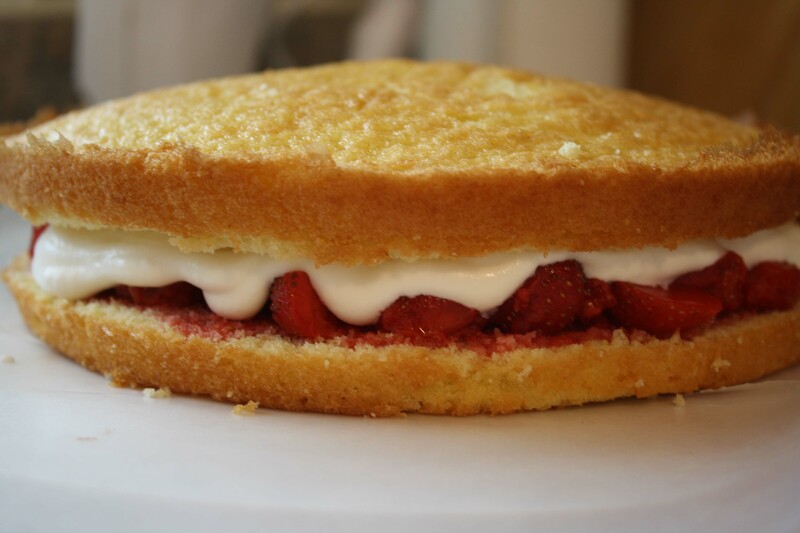 I messed up with the size of the pan and ended up with a one layer cake…! yours looks delicious!! I can certify that the cake tasted as good as it looked. Love how Rachel ios helping her Mom in the kitchen!! Spectacular! It looks so delicious!